In the latest renovation at their church and on their grounds, Crystal Hills Assembly recently completed remodeling their sanctuary. After nearly three months of work, Crystal Hills Assembly is back in its renovated sanctuary. The Assembly of God church, located five miles east of Paynesville on Highway 55, started renovations of their sanctuary in July and celebrated the completion with a dedication service at the end of September. 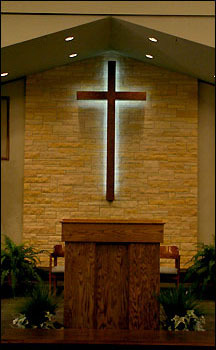 In the sanctuary, a new sound system, computerized video, a new sound cabinet, a new pulpit, and new lighting were added. The pads on the pews were redone, and the walls were painted white. The sanctuary had not been renovated since 1976 when the room was a restaurant/dance hall at the night club/ski chalet. The goal was "to update (the sanctuary), to make it more inviting," said Pastor Lonnie Gleitz. "To make it feel like you've come home," he added. Having a nice sanctuary is a good way to honor God, added Gleitz. "Don't you think God's house should be the nicest place in town?" he said. This project started in the middle of July, and the church spent over $100,000, probably closer to $200,000, on renovations, which also includedmoving the library, adding fire safety measures, and making renovations to the fellowship hall, where services were held while the sanctuary was being redone. Crystal Hills Assembly has actually been renovating its buildings and grounds for several years. Work started in the 1990s with a new septic system, in reroofing the church, and by converting the fireplace in the foyer to gas. Crystal Hills Assembly has remodeled their church buildings and grounds in recent years. The church purchased the 100-acre property in 1976. 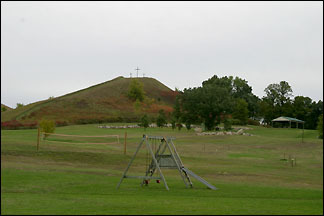 In the past four years, the church has renovated bathrooms; carpeted and repainted the office areas, including leveling the pebble floor and filling a hole below one office; created a memorial garden and built a gazebo overlooking Mud Lake, as the Crow River is known as it flows between Rice Lake and Lake Koronis; built a campground, including four sites with electrical, sewer, and water hookups; added a bathroom to serve tent campers in the A-frame house that used to sit on top of the ski hill; recemented the sidewalks by the church to provide better handicap access; and refurbished their sign on Highway 55. Church members also added a sand volleyball court this spring. "We have a beautiful facility and a beautiful property," said Gleitz. "It's a shame to not be using it to minister and to glorify God." The church, which has 100 members and an average Sunday attendance of 130 people, owns over 100 acres, including the three man-made ski hills and about a half mile on Mud Lake. The church has a mile or so of walking trails that are open to the public. Most of the projects were done with money on hand, though they may have to borrow a little to complete the sanctuary, said Gleitz. "God has just provided," he said. "He's been faithful, and the people have been faithful." While the church has hired professionals for carpeting, electricity, and plumbing, church members have done much of the rest of the work. Gleitz estimates that the congregation has done 80 percent of the work. "Anything the people could do, we did," said Gleitz. "Without them, none of this could have gotten done. Between their labor and their finances, it's been them and them alone." The Gospel Tabernacle was founded in Paynesville in August 1931 after a local group attended an Assembly of God Bible camp, according to the history book, Paynesville: Year 125, published by the Paynesville Historical Society in 1983. The Paynesville Gospel Tabernacle was built later in 1931 at the corner of Minnesota and Maple streets. Only the basement was built originally with the rest of the church added in 1940. The most recent part of the Crystal Hills remodeling project was updating the sanctuary this summer. The church repainted and redecorated their sanctuary, starting in July, and dedicated the updated sanctuary in late September. Shortly after the church was organized in 1931, it affiliated with the Assembly of God and changed its name to the Paynesville Assembly of God Church. The congregation purchased the night club and ski chalet and adjoining property in 1976 and subsequently changed its name to Crystal Hills Assembly. The ski chalet and night club were remodeled immediately after that purchase but many areas of the church had not been updated since. Future remodeling at Crystal Hills may include painting the exterior (or using maintenance-free siding), replacing the lighting and getting new furniture to replace the vinyl chairs from the 1970s in the foyer, building a reflection pond, or possibly even constructing a cemetery on the grounds and adding an elevator inside the church.